After having been on the road for eleven years, I figured it would be a good time to reflect on our essentials in the recovery gear department. Before starting our adventure we had to take decisions on what to bring. Our choices were facilitated by the fact that we didn’t have the financial resources to buy all the fancy gadgets out there on the 4×4 market. on Ebay, but didn’t succeed since we were not going to fork out $130 a piece, especially since we were not going to travel to the Sahara. Instead we bought a hi-lift, a second-hand shovel and a small axe. As we grew from rookies into professional overlanders and experiences piled up, we discarded disused tools and acquired new stuff. Today these are our essentials (in random order) for wandering off the map. Without these we would feel not confident to enter that muddy forest trail or check out that way too-soft-sandy beach. Correct that: at least without the first three mentioned below, we would have been in serious trouble. 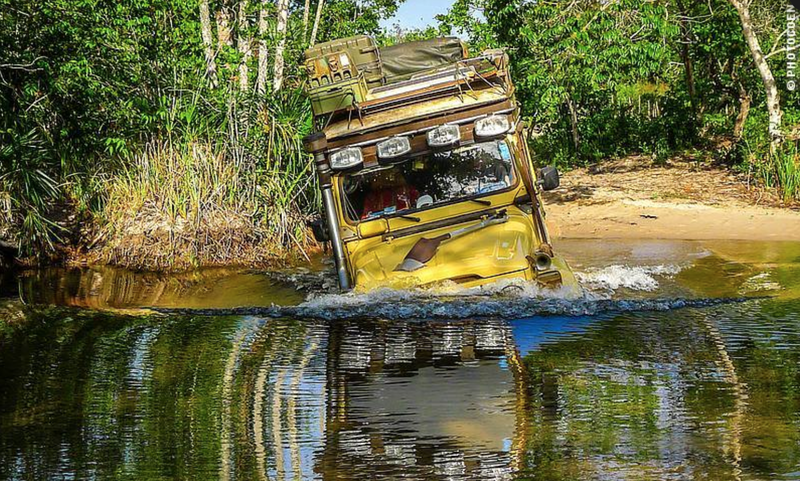 No matter what gear, it helps we drive a reliable, high-clearance 4×4 vehicle. Please understand this: the items mentioned are personal choices and region dependant. 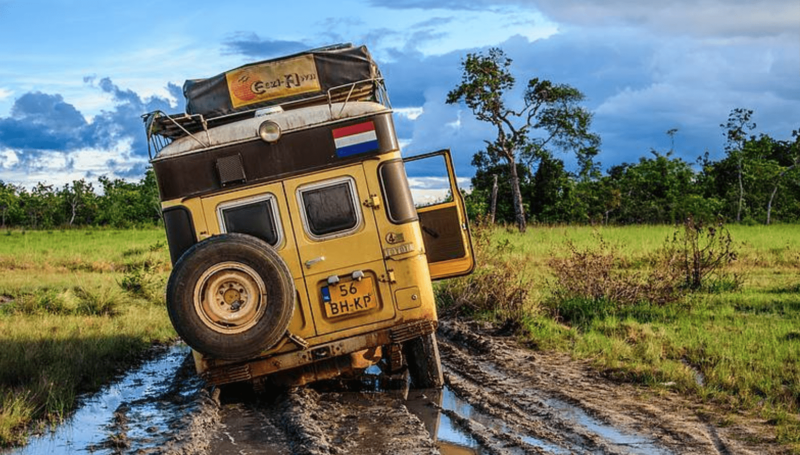 Not every overlander needs them. 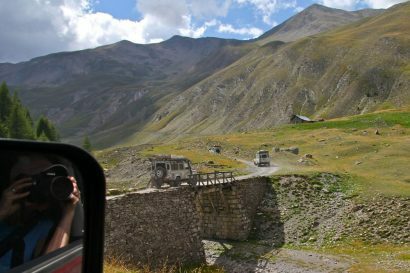 We just want to share how these tools have helped us to explore off-the-beaten tracks. is a mechanical device that is not hampered by electrical shortcomings such as an electrical winch. 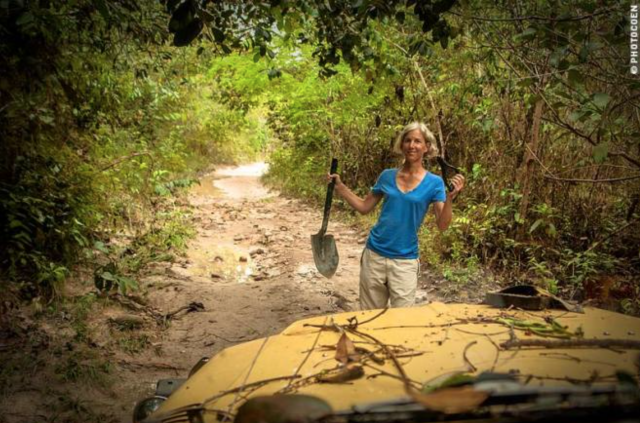 The thing that struck me most is that the few times we needed to winch a car out of the mud was that the vehicle was so deep in that it didn’t move an inch. Even pulling with two vehicles and two winches didn’t do the job. We took the Hi-Lift, lifted the car’s differentials out of the mud, stuck some wood underneath the tires, and nudged the vehicle out of the bog with a tow strap. No doubt that there are enough other situations where a winch would do the job. We’ve seen our share of stunning performances during the Rainforest Challenge in Malaysia. 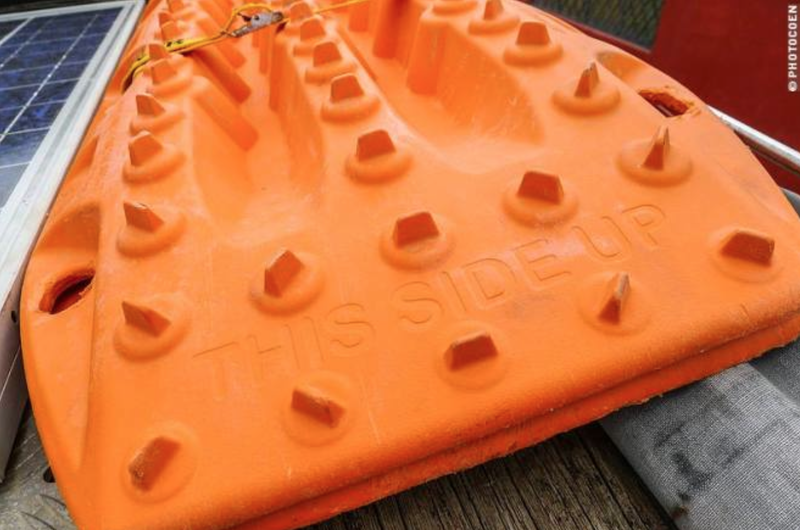 Does your vehicle (or the one you’re rescuing) have enough lifting points on your chassis or bumper? ; we carry a simple aluminum 30×20 cms plate. Keep the hi-lift clean and the moving parts creased. How I know? We once got stuck and I spent an hour on cleaning the rusty tool before we could use it again. To dig a latrine when camping somewhere for a longer period of time. To move hot coals from a fire for a BBQ. 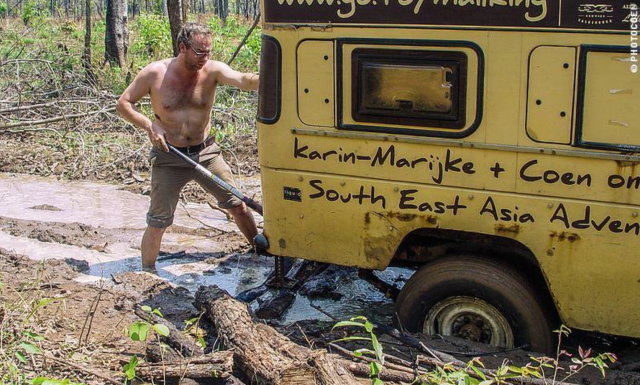 However, that changed when we got in some serious trouble and got stuck in deep mud in South East Asia. I lifted the Land Cruiser in the rear with the hi-lift while Karin-Marijke used the shovel to free the wheels so we could get some wood under them. 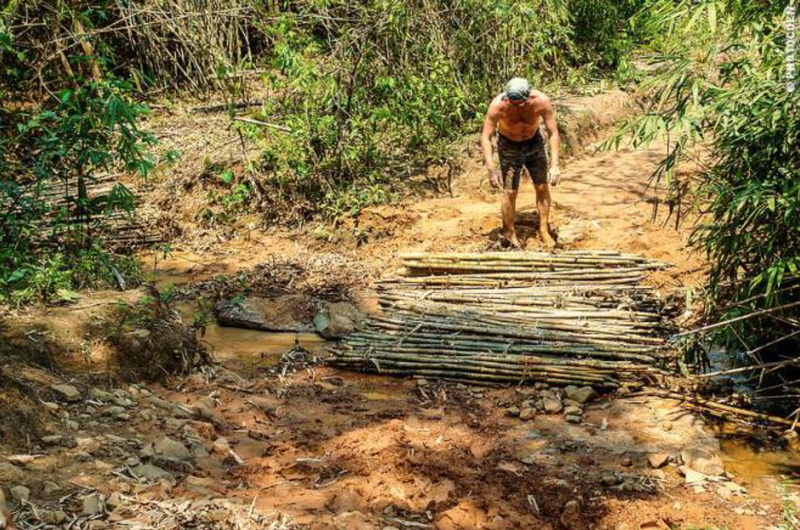 No matter the effort, the mud holes kept filling up with muddy water until a local showed us how to dig a narrow gutter to channel out the water. Hey, we all have to learn, don’t we? Simple but brilliant. The shovel proved an interesting challenge as sits on the bonnet. As a result it is always exposed to the elements. The wood rotted away even after I sanded the handle a few times and applied good layers of lacquer. The result: needing the shovel in the middle of nowhere and the shaft breaking in two. When we needed to replace the wooden handle for the third time, I searched for tropical hardwood but didn’t succeed. 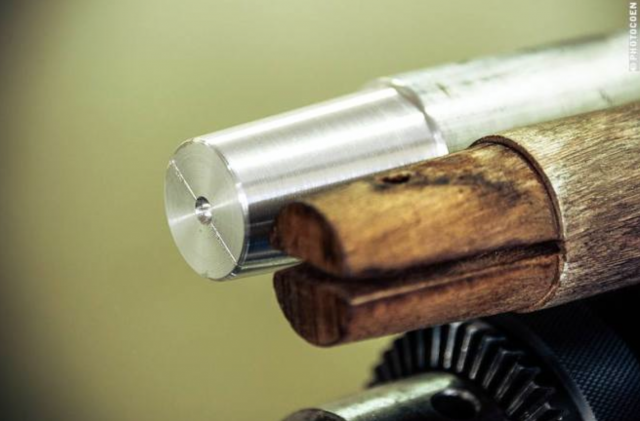 The mechanics of Platinado in Manaus upgraded it to a custom-made, aluminium shaft and handle. A solution for life. Experience has shown that the above-mentioned items will generally get us out of precarious situations. However, both are useful when getting stuck in soil. 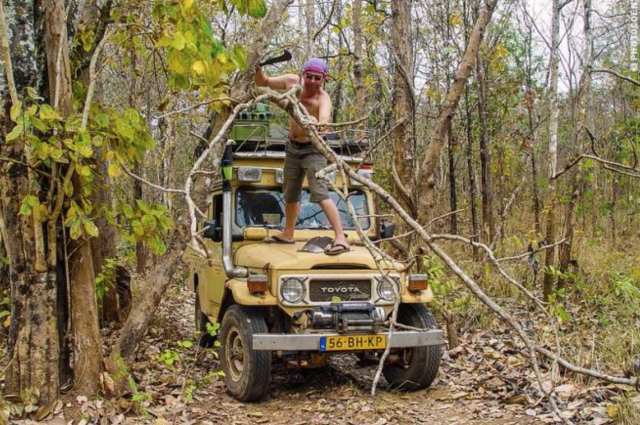 Sometimes the challenge lies somewhere else: a fallen tree across the trail, or low-hanging branches that are too thick and heavy to be pushed over the Land Cruiser’s roof. We left the Netherlands with a cheap axe. It was practical to make kindle wood with but not so much to cut thick branches, let alone a trunk. Already in Greece the axe got replaced by a curved machete that served us well for a long time. However, I was limited when building campfires and wanting a saw to cut thicker pieces of wood. But then, where do you pack away a saw? and I was sold. Of course, I still needed to battle Karin-Marijke objections in her role financial director and inventory keeper, but I succeeded and she has often admitted that this has been a good investment. This saw packs nifty and small. 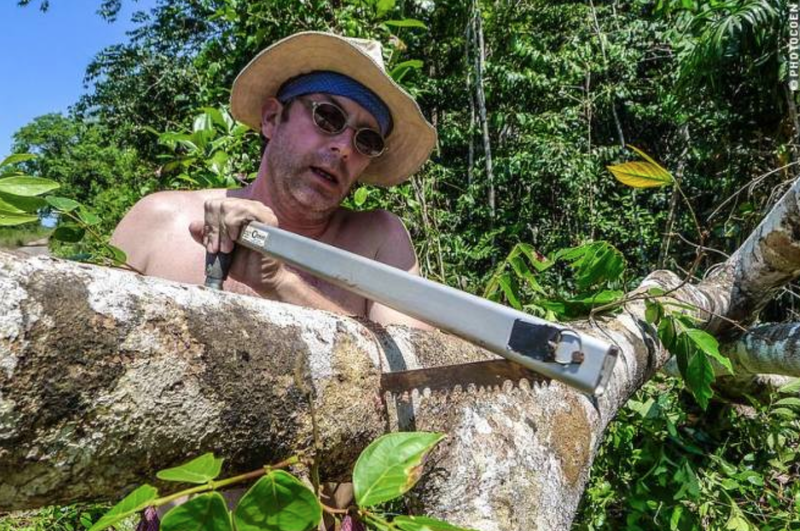 You can unfold into a full-size, triangular-shaped bucksaw in a trice, and you can easily operate it by one hand. It is made of aluminium and so it weighs almost nothing yet feels extremely robust. The blade does not warp as easily as other, similar bow-saws. With the knowledge that we have gathered on our journey, the above-mentioned gears are the ones we would buy were we to start all over again. The hi-lift and shovel are attached to the outside of the Land Cruiser and the saw takes minimal packing space. All three are relatively inexpensive and light yet they have gotten us out of tricky situations. Having said that, the following items do enhance a feeling of security and no doubt increase the possibilities of getting us out. We would not have bought them on our own but are very fortunate to have friends around the globe who gave them to us. Winches come in a few varieties [electrical, hydraulic, mechanical] but all share the same basic characteristics of being costly and heavy. With the age of synthetic lines you can save on the weight but still you have to dig deep into your pockets. 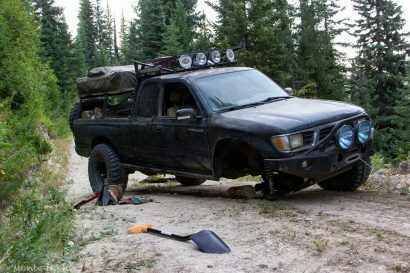 An interesting detail about winches: it is often of use to help others get unstuck. But hey, that may help you get karma points, or it can simply be fun and rewarding to help someone else. Asking for a tractor with driver in a nearby village (Guyana). Asking fellow 4×4 drivers during rallies in Suriname. to us in Bolivia to replace our defunct Ramsey. Thanks guys! We look forward to putting it into practice. 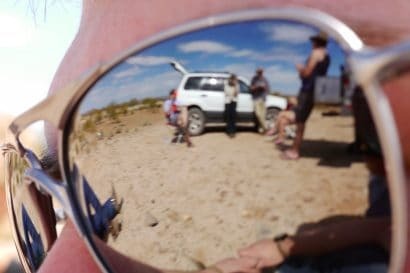 Because we planned to drive to Asia, we took a 4×4 training focused on traversing mud rather than dunes and deserts [read about it here]. I didn’t feel the need to buy expensive aluminium sand-ladders or the less-expensive but heavy, military-steel sand-ladders. We started missing sand-ladders even though we stayed away from sandy areas: rickety bridges. 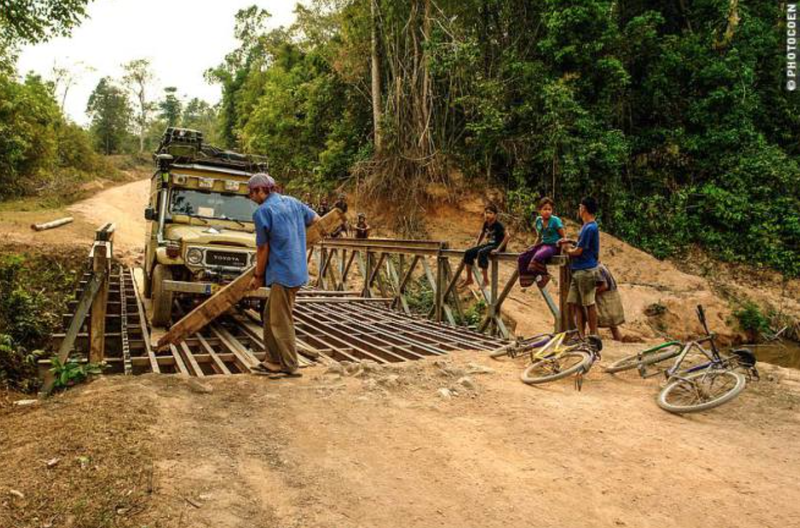 In Asia as well as in the Amazon we have regularly wished for sand-ladders to guarantee a safe crossing of heavily damaged bridges.
. Thank you, Benjamin for donating a set. While the terrain hasn’t been rough enough to test the winch, we have extended our boundaries of unpaved, sandy roads thanks to a simple purchase: a compressor. For years we didn’t bother, not realizing that in fact it was holding us back in some areas. Sometimes we wanted to air down the tires but didn’t because we had no clue to as when we’d be able to inflate them again even though terrain might demand it. in a local hardware store. It is a bit slow but does the job. Note that you don’t need a compressor to get you out of a tight spot. 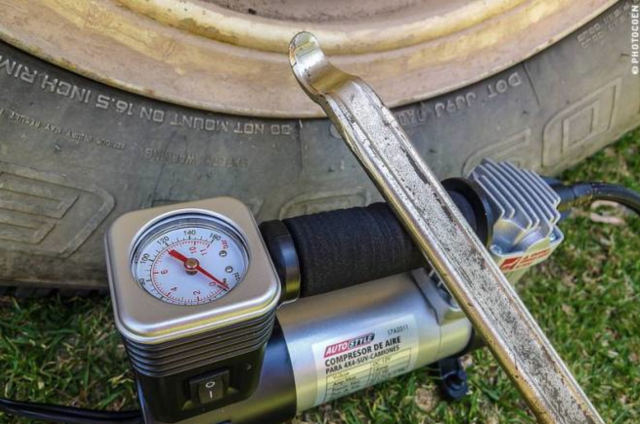 We use it to get the tires back on pressure after the off-roading, so we can drive on the asphalt again without overheating the tires. 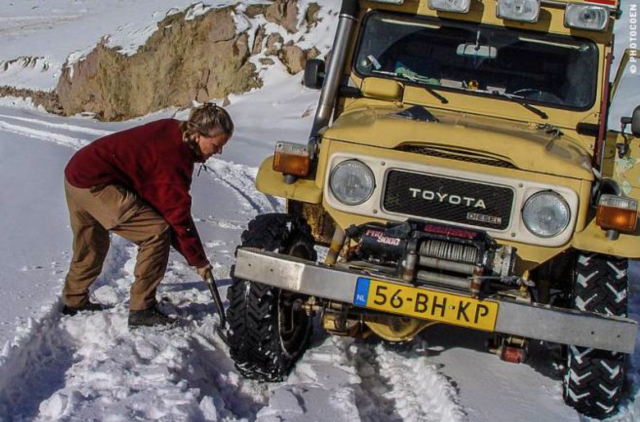 Of course we have more gadgets in and around the Land Cruiser [read about them here], but these are our absolute favorite recovery tools that work best for us at this moment. This may change in the future. When that happens I’ll update this post. In the meantime, please use the comment section below to share what works best for you. Note: Some product links in this post are affiliate links, which means that if you decide to shop there, we will get paid a little commission. Your price will always be the same.